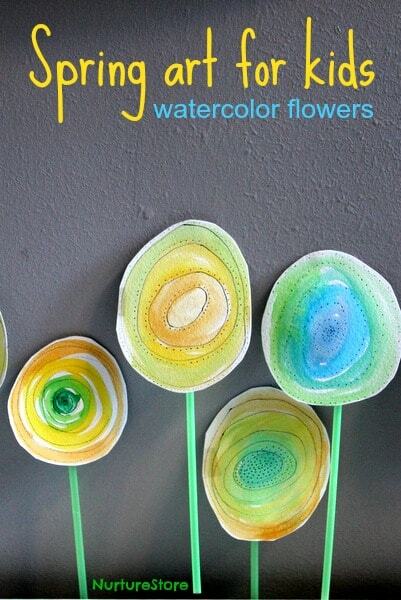 For some pretty spring art for kids, using an interesting painting technique, try these beautiful watercolor flowers. 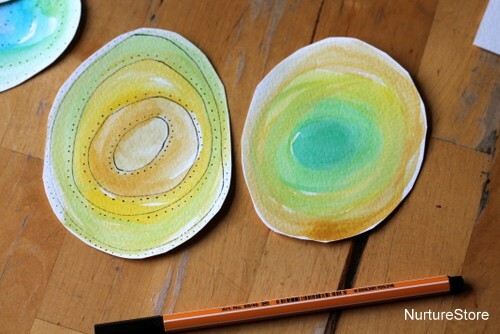 These spring flowers combine painting and drawing. 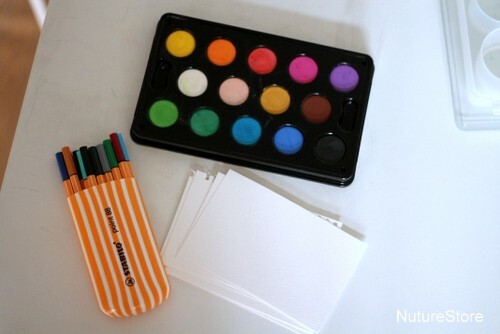 To make them you’ll need some watercolor paints, watercolor paper, and some fine marker pens. 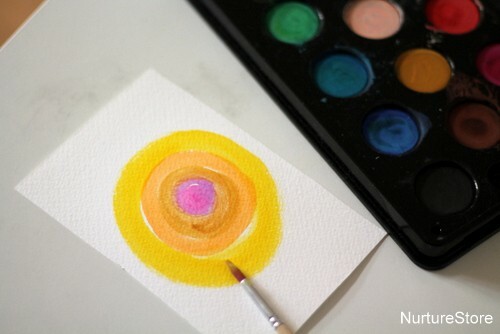 Begin by using the watercolors to paint some simple flower shapes. 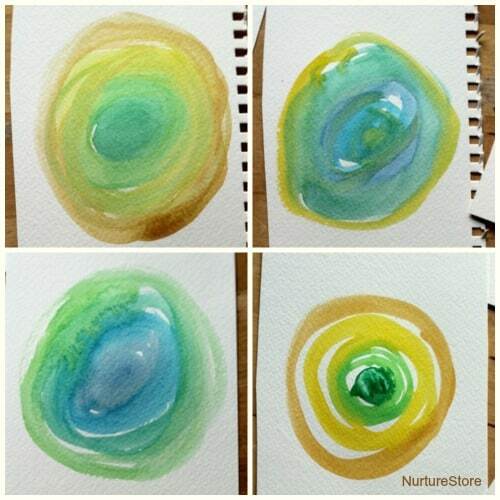 We used concentric circles, mainly using shades of yellow, green and some blue. Using proper watercolor paper really does make a difference – it takes the paint beautifully, and it gives some stability to your finished flowers. Experiment with different flower designs. 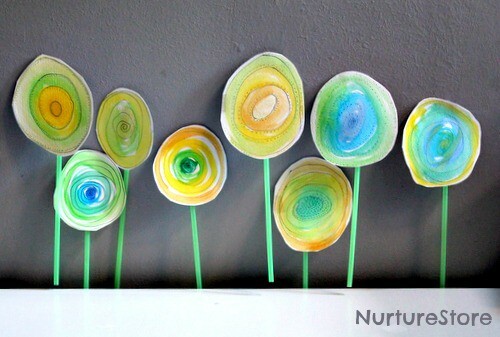 Use neat circles or relaxed curves, overlap the circles or keep them separate, and try several flowers using different combinations of your colors. Each will be unique, with the natural flow and blending that comes with using watercolors adding to the individual effects. Once your watercolor paint is dry (and do be patient and wait, or you may find this next step doesn’t work so well), you can add another layer of detail onto your flowers. Take a fine marker pen – we used black and dark brown – and draw patterns on top of your paint. 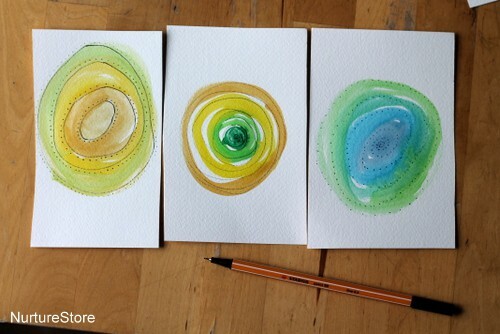 You might like to draw circles, spirals, dots or dashes. Embellish all the flowers in this way, or leave some just with the watercolor. 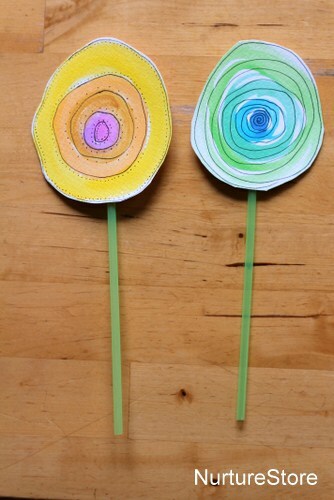 Then cut out your flower heads and fix a green drinking straw on the back using sticky tape. The finished flowers look so pretty in a vase, or lined up in a row along the wall or window. As an alternative, you could tape a paper clip on the back instead of the drinking straw, to give you a bookmark clip. Or glue a brooch pin on the back to make a spring corsage to pin on your jacket – so stylish! 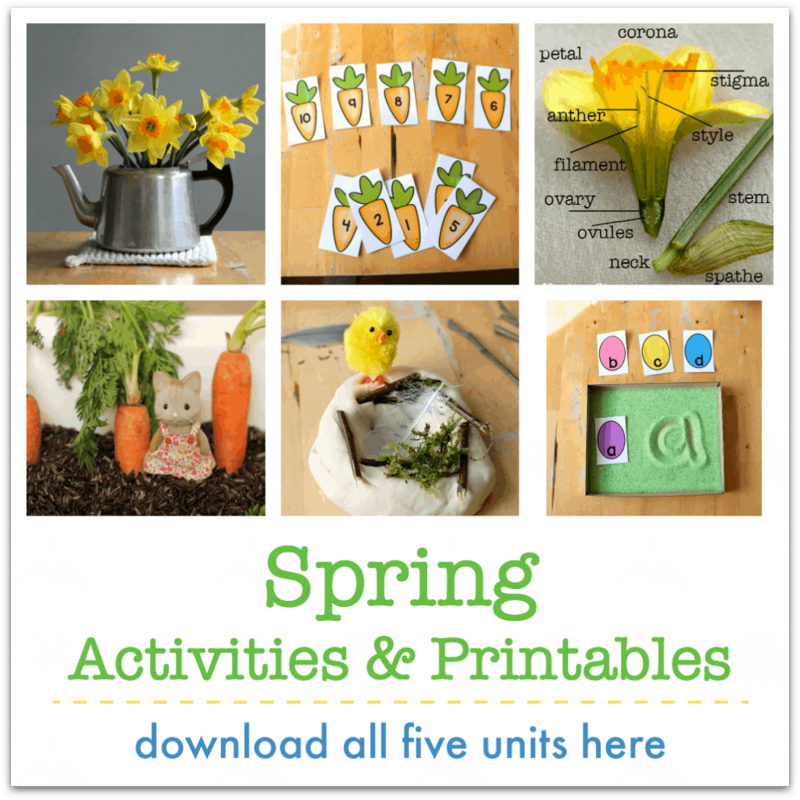 For more spring art for kids, take a look at our spring flower meadow art – it’s a great collaborative project. Create some pretty daffodil bunting. Or make this pretty flower bouquet, with four designs to suit all ages.